With this iExpression you can distribute 3D layers on a 3D grid. Just specify the first layer and all other layers that you apply the iExpression to, will be placed next to this layer in the given distance. 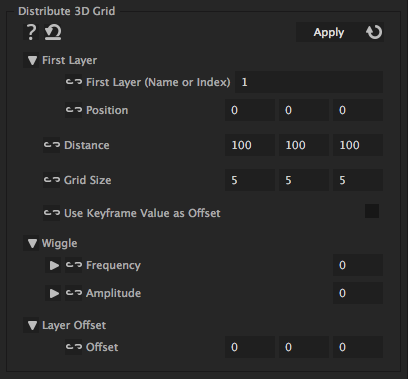 You can still move layers away from their grid position using their keyframe values or the wiggle parameters. is the name or index of the first layer. This layer is the upper, left, topmost corner of the grid and its position determines the position of the grid. is the position of the first layer in the grid. is the distance between neighbouring layers in the grid. denotes how many layers should be placed in one row, one column, and behind each other. allows to move each layer away from its position in the grid using keyframes. In order to be exactly placed at its position in the grid, a layer then must have exactly the same keyframed position as the first layer of the grid. If the position is different, the difference is used as an offset to the grid position. makes the layer wiggle around its position in the grid with the given frequency. If you don't want it to move at all, set the frequency to 0.
denotes up to how much the layer may move away from its grid position. To create a little less regular but still not moving grid, set the frequency to 0 and the amplitude to some value greater 0.
allows to delete the first rows of the grid (in x, y, or z direction)and insert them again behind the last rows.